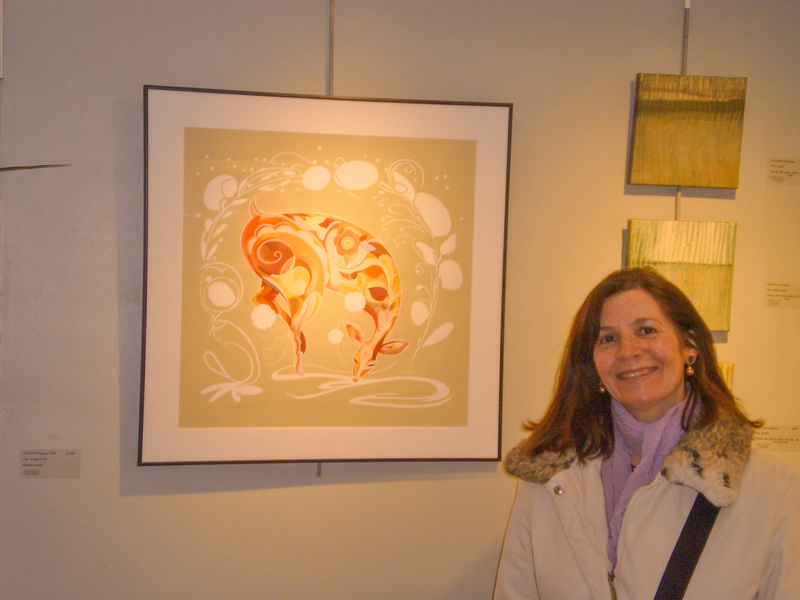 Linda Hampton Smith with paintings on exhibit at the Furchgott-Sourdiffe Gallery, Shelburne, Vermont. Self-portrait as a teenage girl. The illustrations of French artist Adrienne Segur utterly captivated me as a girl. 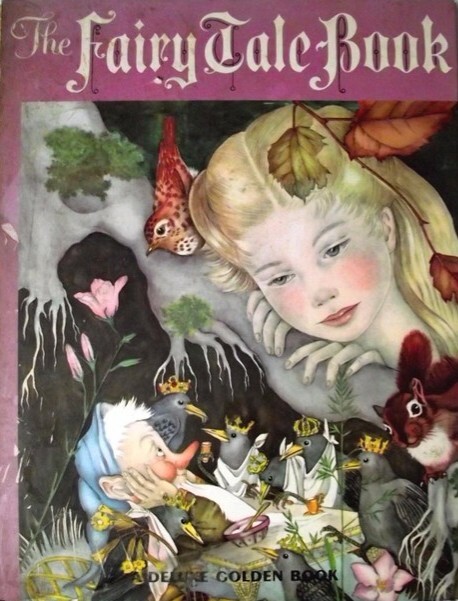 I spent hours reading and re-reading “The Fairy Tale Book” (published 1958, a Deluxe Golden Book), gazing at her breathtaking images, imagining myself as one of her exquisitely adorned characters. It was there that my career in illustration had its beginnings. The spirit of enchantment with which she painted now inspires my own style. So, too, do lessons learned from my elementary school art students. It was they who taught me, really. The magic that spilled onto the page from each of their hands and hearts invited me to believe with them in boundless visions of hope and discovery. 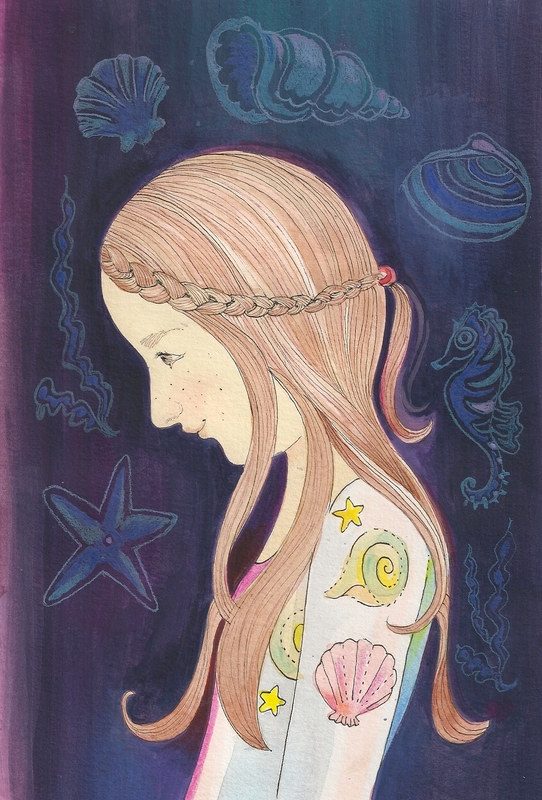 I’m thrilled to illustrate stories that celebrate life’s beauty, magic, and mystery for the child within us all. The Fairy Tale Book. A Deluxe Golden Book. 1958. Illustrations by Adrienne Segur. Linda Hampton Smith grew up in Merrick, New York. She majored in Studio Art at Adelphi University, winning the A. Conger Goodyear Award for outstanding artistic achievement, and went on to teach art in public and private schools on Long Island. She continued her studies with Parsons School of Design where she studied plein-air painting and prehistoric art in Paris and Southwestern France. This experience served as an inspiration for an enterprise of greeting cards and gift items called “The French Easel.” A line of her handmade cards was represented by Constance Kay, Inc., and sold in shops throughout the metropolitan New York area. After studying painting and 2-dimensional design at the Art Student’s League, Linda became a hand-colorist of antique engravings at the Phyllis Lucas Gallery in Manhattan. Upon moving to Vermont, she taught art at the Vermont State Craft Center and the Leicester, Weybridge, Ripton and Salisbury elementary schools. She says that her greatest inspiration, by far, has come from her young students, whose gleeful approach to the blank page gives her courage. For the past 29 years, Linda has restored paintings with her husband, Randy Smith, for collectors, galleries and museums. 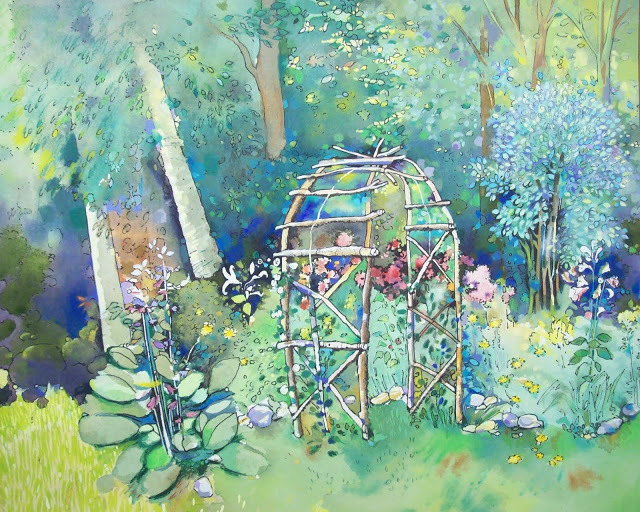 “Rose Arbor” by Linda Hampton Smith. Watercolor on paper. A True Tale. How a Single Jar Changed My Life.